Please stay tuned for a new petition relevant to the most recent activities! 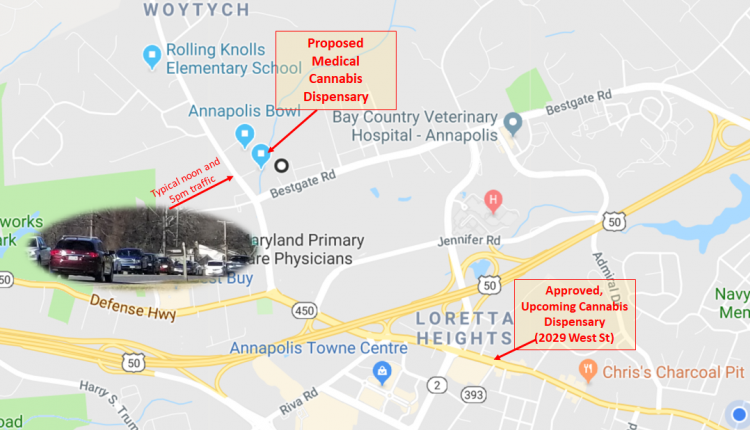 Kind Therapeutics seeks to place a medical marijuana dispensary at 2061 Generals Highway, which is located next to the Saltworks Creeks renovation, beside Annapolis Bowl, adjacent to Matthew Weller's Farm Outlet, and behind the OpenPath Products office building. They are requesting a Zoning Variance from the county because dispensaries may not be within 1,000 feet of residentially zoned property and their proposed location would be 160 feet from residentially zoned property. -	be detrimental to the public welfare. -	It will Increase traffic in an already highly congested area. The Variance Opposition for 2061 Generals Highway Cannabis Dispensary petition to Residents, Businesses, and Concerned Citizens in Anne Arundel County was written by Richard Smith and is in the category City & Town Planning at GoPetition.